Increased awareness of ryegrass as a potential forage has occurred in the upper Midwest. Ryegrasses are excellent, high quality forage, establishing rapidly and producing good yield in the seeding year if cool (50 to 75°F) exist and adequate moist is available. Ryegrasses have low tolerance for water stress. Several ryegrass types exist and species within the ryegrass genus (Lolium) readily cross with one another, resulting in a wide variety of plant types. This may cause some confusion when trying to determine the best choice for planting. Below is a brief review of the types of ryegrass which have potential in the Midwest. The U.S. has nearly 1.2 million acres of annual ryegrass (Lolium multiflorum Lam. ); 90% of which is in the southeastern U.S. Also called Italian ryegrass, it is native to southern Europe. However, annual ryegrass is not a true annual and may behave as a biennial or even a short-lived perennial depending on environmental conditions. In areas of the northern US and southern Canada with reliable snow cover, it can survive for 5 or more years in mixture with perennial legumes. Its primary use in the southeast is as a winter pasture where it is planted in fall, grazed during winter, and then it dies the following summer. Annual ryegrass has very little cold tolerance and therefore would behave like an annual in the Midwest except in mild winters or with excellent snow cover. It has potential, as an annual forage crop, to provide high quality grazing for dairy cattle. It produces high yields and maintains productivity through the midsummer slump better than most other cool season grasses. It is easy to establish and grows rapidly. True annual plants will produce heads in the seeding year, while Italian types will not. Heading reduces quality unless plants are grazed or harvested prior to seed head emergence. Planting later maturing varieties will make it easier to harvest before heading occurs. Annual ryegrass is the grass of choice for frost seeding to improve pasture quality because it establishes rapidly, yields better than other ryegrass types through summer, and has the highest yields in the seeding year. It is also recommended for use as a cover crop when establishing new seedings of pasture. Adding it to a seed mixture with a legume and a more permanent cool season grass, like bromegrass, timothy or orchardgrass, will provide rapid growth and high quality forage in the seeding year. The ryegrass will die in 1 to 3 years leaving behind the other grasses and legumes. Both forage and turf types of annual ryegrass are available. Turf types are low growing and have poor yield. Turf types are also infected with a fungal endophyte that lives inside the plant, protecting it from insect attack, but producing a toxin reducing performance of grazing animals. Plant only forage type cultivars for grazing or mechanically harvested forage. Perennial ryegrass (Lolium perenne L.) is native to Europe, Asia and North Africa. The U.S. has about 250,000 acres, most of which are in the northeast and on the pacific coast in Oregon and Washington. It is best adapted to mild-temperate climates. It is one of the highest quality forage grasses. The primary use of perennial ryegrass is for pasturing cattle and sheep cows. Perennial ryegrass is more persistent than annual ryegrass but less persistent in the Midwest than other cool season grass species. It tillers more profusely but is lower growing than annual ryegrass and will not form a seed head in the seeding year. It is more susceptible to a summer slump than annual ryegrass. Perennial ryegrass will head early under dry conditions after the seeding year. There are both diploid (two sets of chromosomes) and tetraploid (four sets of chromosomes) cultivars of perennial ryegrass. Tetraploids have larger tillers and seed heads and wider leaves. Tetraploid types tend to be taller and less dense than diploid types, even in early stages of regrowth. They are usually more disease resistant and may be higher yielding than diploid types. Few diploid varieties perform well in Wisconsin as they go dormant during mid-summer. Currently available tetraploid varieties are Bastion, Citadel, Condesa and Fantoom. Perennial ryegrass should be grazed closely and frequently. It recovers rapidly and tillers extensively. Plants will not stockpile well and must have good snow cover to survive the winter. Ryegrass is susceptible to crown rust. This disease can seriously defoliate the plant. Plant only rust resistant varieties, if possible. Perennial ryegrass should be used mainly for grazing or hay/haylage in mixture with red clover in northern Michigan, Minnesota, and Wisconsin where snow cover makes 3-year stands likely. Perennial ryegrass, like other ryegrass types, can also be frost seeded in early spring to help maintain it as a component of a permanent pasture. Both forage and turf types of annual ryegrass are available, as with annual ryegrass, but plant only forage type should be planted cultivars for grazing or cut forage. Intermediate, or short rotation ryegrass (Lolium hybridum, Hausska. ), is the result of a cross between annual and perennial ryegrass. As such, it is intermediate in many of the above-mentioned traits. It is less winter hardy but higher yielding than perennial ryegrass. Its uses would be similar to perennial ryegrass. Bison is the only currently available variety. Its recommended use would be for grazing or hay/haylage production in northern Michigan, Minnesota, and Wisconsin. Festuloliums (Festulolium braunii, K.A.) are derived from a cross between either Italian or perennial ryegrass and meadow fescue or tall fescue. The name is a combination of Festuca, the genus of fescue and of Lolium, the genus of ryegrass. Meadow fescue is a close relative of the more commonly grown tall fescue grown in the mid-south region of the U.S. and used for pasturing beef cattle. Meadow fescue is persistent, easily established and managed and exhibits rapid regrowth and good disease resistance. It has not been widely used however due to poor palatability resulting in animal consumption inadequate to support high milk production in lactating dairy cows. As festuloliums have better persistence, disease resistance and winter hardiness than ryegrasses and better season-long productivity and higher forage quality than fescues (more like ryegrass). 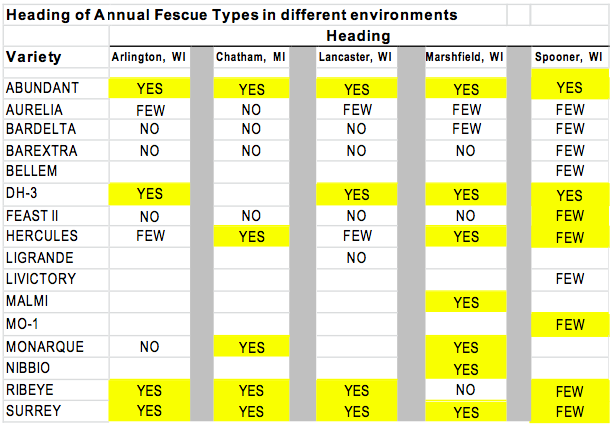 Some varieties are more like the ryegrasses and some more like the fescues, depending on the breeding effort following the cross. Tandem II is the only currently available cultivar. Cool season grasses require vernalization (exposure to a period of cold temperature) in long days to initiate flowering). This ensures that seed production occurs at the optimum environmentally favorable time, normally following the passing of winter. However, the coldness and length of exposure to cold required for vernalization varies with grass species and variety. Generally, perennial ryegrasses require the most cold for the longest time (45°F for 8 weeks, or colder for a shorter time) and Italian ryegrasses require the least (45ºF for as little as two weeks) with true annuals always flowering in the seeding year. The table below shows that some Italian and annual ryegrasses headed in some environments and not others within the same seeding year (2007). Winter climates have become more variable and less reliable; therefore, we expect heading to occur, particularly of some Italian types, on a more frequent basis in the seeding year.